The e-book market is a relatively new market for publishing for Government. These are some key findings for the e-book publishing. E-book publishing formats go beyond a PDF. In the past it has been very common to use the PDF format, which several years ago became popular. However, over time the saturation of PDF has not moved to the mobile market well. In some cases it takes too long to download a PDF onto a mobile device. Although free mobile readers such as Aldiko will allow you open PDF’s , many PDF’s are not formatted to read in a readable format on a mobile or tablet device. Larger PDF’s assume Wi-Fi connection. There are more than 30 current tablets on the market today. The most popular readers are Nook, Kindle, iPad, and Samsung Galaxy Tab. Major competitors, such as Apple and Google, continue to be in the market, in addition to Microsoft with Windows 8 platform. Typically when publishing “free” e-books, there is not an IBSN needed if you have a free book agreement. iBookstore[ii] – Free book account allows you to offer free on the iBookstore. You can use iTunes Connect to publish. You need an AppleID with credit card on file (for identity verification purpose). Legal entity name affiliated with US Tax ID is required. EPUB and multi-touch is the only format accepted in the iBookstore, no PDF’s. All submitted books must pass the latest version of ePubCheck, include only files listed in the manifest, and use UTF-8/16 characters. Magazines and other periodical are not supported by the iBookstore. Amazon[iii] – Mobi format (only unencrypted), plain text, some PDF’s . Not all PDF’s display well on Kindle. Source content such as HTML, XHTML or EPUB can be converted. In most cases, it is simpler to just offer several format options on your own website rather than publishing to e-book outlets. 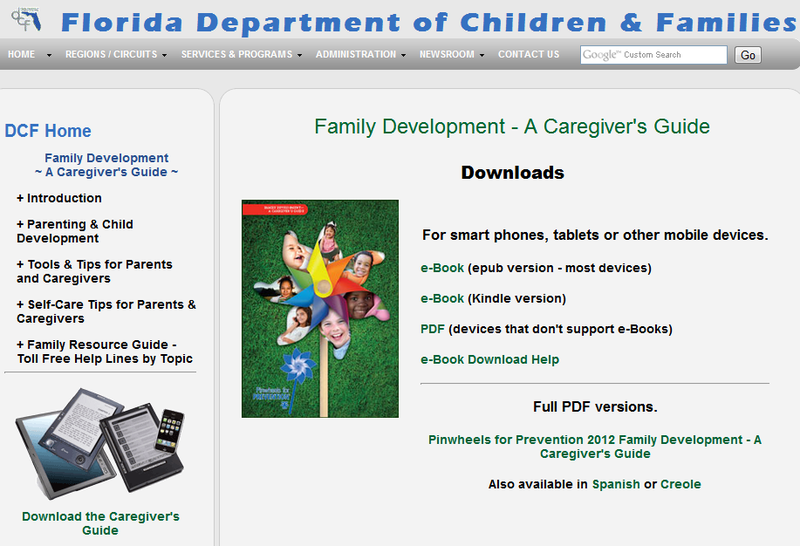 This is an example of how the Department of Children and Families provides their caregivers guide for download in multiple e-reader formats. There are several software products that are freely available; however, some only save to one format or the other. There is not a good consistency and it is early in the market for having a software product that will save to multiple platforms. Anthemion eCub Start from scratch of import existing text/HTML, ePub files.Create a cover design. The cover design is not real intuitive. Not an editor. Just software that allows you to import and convert to ePub format. Anthemion Jutoh Simple editor with basic formatting. Works better if you have not written a book and you would like to publish in a e-book format. Good tool if you don’t have Adobe InDesign.Java based. Calibre E-book Management. Import PDF and convert to EPub format (single or in bulk). Extra plug-in can be downloaded free (example: EPubMerge – allows merge of multiple ePubs into one file). MobiPocket Creator Works fine for .MOBI format. Interface is a little clunky. Sigil Open source software provided by Google. Allows you to create an e-book from scratch. The editing is similar to creating a web page for a website. DAISY Daisy is a plug-in that works within MS Word 2007/2010 to convert documents to an audio book format. It does require proper use of styles. Adobe Indesign (not free) Does have a convert option to download plugin from Amazon save to Kindle format . The plug-in is free, the main software is not free, Indesign license required. For digital publishing the overall workflow hinges on a strong use of styles to create structured flow of text. Does have ePub export. Adobe has some extra resources for Epub check, preflight and generator based on Java. Meta data is an important part of documents. Metadata includes such information such as document author, date, title of document, etc. Setting document properties within the document should automatically translate over to metadata. The following is an example of document metadata. Most document metadata is pulled from the document properties. There are many free e-readers on the market and many can be obtained free. When downloading an e-reader consider one that does both MOBI and EPub formats. Additionally, another element, that is a personal preference, is how the document displays and it is easy to navigate from page to page. For example some documents display vertical rather than horizontal (and vice versa). The reader may prefer one orientation to the other. Many e-readers are not intuitive enough to easily import PDF’s into your reader library. From the computer desktop, the readers are still in an early market. Calibre reader will read multiple formats including Mobi, PDF, EPub, HTML and Word Documents. Having good up-to-date metadata in your documents helps readers index your e-book library for efficiently.